The website had been deteriorating for some time. The previous code base had cross-browser issues and did not degrade very gracefully. The EHC team had worked for some time to fix the problem but had only made minor improvements. Other firms had been brought in to redesign and fix the coding problems but their efforts were not effective. Emory Healthcare is owned and governed by The Woodruff Health Sciences Center and Emory University. XI Interactive was brought in to help because of their successful work on several web sites at Emory University. To create a new design based on a new marketing study, to develop a new code base that would be stable across all major browser platofrms, and to implement the changes in the Content Management System. This web site lives in Content Management System (CMS) by Merant - Collage. The web site is over 11000 pages. It has been through the initial CMS implementation and several redesigns and there is much work to do to optimize the site within the CMS. The departmental pages were in the CMS but the primary top 150 pages were outside of it. This meant that there were separate code stacks and opportunity for loss of coding integrity. 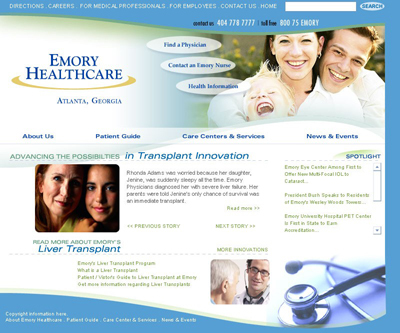 Emory Healthcare also wished to feature their "Advancing the Possibilities" campaign that educates the public about their brand equities such as Transplant Innovation, Cancer Research and Care, and more. The marketing study proposed going a new direction. They wanted a friendly face that would appeal to the community health care consumer. Photography would be happy healthy families instead of technical equipment and visions of the inside of hospitals. The vision was to portray health. The consumer health decision-maker is typically the female in the family. Emory Healthcare wanted to appeal to the communities in which their facilities were established and become the community health facility of choice. We took a good long look at it and decided that we were going to do it right even if it cost us. Doing it right meant spending a lot of time reworking the content in the CMS. We rolled all the pages into the CMS so that we could work efficiently with our programming and designs and not have two separate code bases. The design styles are instituted programatically to the page content and metadata. According to the marketing study, the design needed to appeal to the demographic of the family healthcare decision maker. It needed a more feminine flair with a softer curvier look to it. We created a Flash home page with multiple photographic elements in it. The Flash included a patient stories feature showed EHC effective in its brand equity services. The home page flash also utilized RSS based news feed to deep link into news content. Featured news highlights were displayed in a rotating fashion with photos, captions and deep links to detailed stories. All of the pages of the site were placed into the CMS making them easier to manage. Once all the pages were equally established in the system and all the page metadata was gathered, then the CMS facilities were used to create S.E.O. features (search engine optimization) to help the web site index better with search engines. The code base is now very stable and the design is consistent throughout the site. Their marketing campaign space is very effective at telling the story they want to tell. Flash controls allow the visitor to view different story photos and captions before clicking through to deep content. News content is served well in the Other Features section and in Spotlight News with the RSS feeds. The design is complete change for anything they have had before. It is a very eye-pleasing design... truly beautiful.